With fuel prices on the rise many companies are looking at ways to save money. In an effort to achieve these savings many companies are now looking at smaller capacity machines that will still handle their day-to-day workload. Enter Bandit's Model 1390XP—this chipper is becoming increasingly popular due to its compact size and ability to process larger diameter material with less power, delivering greater fuel efficiency in the process. This impressive chipper caters to a wide variety of industries, including landscapers, tree service companies, municipalities, forestry organizations and equipment rental locations, just to name a few. We know the Bandit Model 1390XP heavy duty version is the most productive and reliable 15-inch drum chipper available, but we also understand that it takes more than a bold statement to convince the hard working professionals who rely upon chippers every day. That's why we're going to take a closer look at what separates the 1390XP from the rest of the pack, because success in this segment isn't simply determined by a basic set of performance stats or teaser price tags—the latter of which usually point to lower quality construction that will ultimately cost more in the long run. One of the most important factors setting the Model 1390XP apart from other 15-inch capacity drum-style chippers is its oversize 37-inch diameter drum with four knives, compared to the 22-inch diameter, two-knife drums commonly found on other 15-inch capacity units. These heavy-duty drums feature reinforced knife pockets, numerous internal baffles, and thick drum skins. 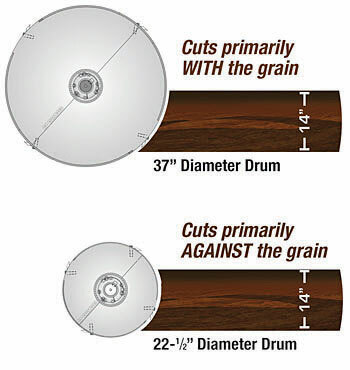 The weight of the combined drum and shaft is nearly double that of the smaller 22-inch diameter drums; this is why Bandit has the reputation for exceptionally durable drums that WILL NOT COME APART, and that's why Bandit drums are backed by a five-year "GUTS" warranty. The larger drum and additional knives also ensure a smoother, more efficient cutting action that reduces vibration. Higher vibration on a smaller drum increases the chance of steel cracking and inflicts stress on other components as well. Larger drums also turn slower; the 1390XP's drum spins at just over 1000 RPM which is approximately half the speed of most 15-inch chippers, further enhancing the chipper's efficiency and effectiveness. Notice from the diagram below that a large diameter drum chips material on the top half, on an angle with the grain of the wood. This will allow the chipper to run much smoother, use less horsepower, feed easier, use less fuel and be more productive overall. As with all Bandit chippers, the Model 1390XP features Bandit's Slide Box Feed System which is simply the best in the business due to its strength and flexibility. This feed system features horizontal top and bottom feed wheels providing unmatched pulling and compressing power. The top feed wheel moves straight up and down with the flow and diameter of material as it enters the feed system, providing direct down pressure for maximum compressing power. The top wheel features two springs on each side that can easily be adjusted depending on the material being chipped. Little or no spring tension can be utilized for chipping larger diameter material, or maximum spring tension can be used for chipping limby trees or branches. This system makes the 1390XP easy to feed while reducing chainsaw work and operator fatigue, leading to greater productivity. The Model 1390XP can also be equipped with a hydraulic lift cylinder. This cylinder allows the operator to simply hit a lever to engage maximum hydraulic down pressure for the top feed wheel. In almost all instances this will allow the material to be fed through the chipper free and clear, without the need to remove it for additional trimming. All Bandit products are constructed of heavy-duty steel and are supported by high quality components. An example of this construction is the 1390XP's 8,000-pound axle with tires rated at 4,806 pounds each, to support the machine's approximate 6800-pound weight. Some competitive 15-inch drum chippers rely upon a 7000-pound axle even though many of these machines weigh as much or even more than the axle's rated capacity. This leaves no leeway for additional options such as a hydraulic winch and its component equipment, further stressing an already overstressed axle. This important rating is often overlooked but plays a pivotal role in the reliability, functionality, and safety of the machine. Excessive tire wear or a premature axle failure can temporarily sideline the chipper, costing time and lost productivity, not to mention repairs costs for components that should've been stronger in the first place. These are the reasons why Bandit elects to use a larger axle for the 1390XP. A wide array of engines power the Model 1390XP, emphasizing both horsepower and torque, and because the 1390XP's drum runs at a slower speed, it requires less power to accomplish the same work in competing machines. 84.5 to 142-horsepower diesel engines are available to handle an extremely broad array of projects, but mid-pack choices like the Caterpillar or Perkins 97 horsepower engines are extraordinarily effective at tackling large jobs thanks to the 1390XP's design. When comparing larger horsepower engine options, the 97 horsepower engines deliver comparable peak torque ratings while achieving better fuel consumption. This is the very definition of accomplishing more with less, and that's exactly what our customers have discovered with the Model 1390XP. The details make all the difference. That holds especially true 12 months into new chipper ownership when Bandit's 1390XP is still chipping while other machines are down for maintenance.